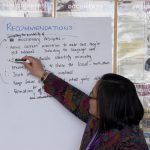 The recent CORE days – ‘Together We Are One – a CO-REsponsible Church’ – on 4 and 11 May both had great significance in terms of the history of the Archdiocese. Large numbers of people gathered at Bishop Viard College in Porirua, almost 163 years to the day since Bishop Philippe Viard sailed into Wellington to begin his ministry as the first Bishop of Wellington. On 11 May in Nelson we gathered again 163 years after Fr Antoine Garin became the first Parish Priest of Nelson. Since 2 May 1850 there have been many changes to the structure of the Archdiocese. What we are currently looking at in the consultation of ‘A Future Full of Hope’ is not new. The Church the apostles knew, the Church Bishop Viard knew, was very different from our reality today. Think of the challenges our own diocesan ancestors faced that are very different from our own. 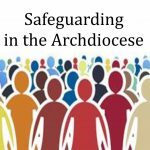 We are faced with the cultural realities of secularism, industrialisation, consumerism, a loss of trust in institutional structures in general, aggravated in our Church by the clergy sexual abuse scandals; the loss of the family unit as the prime transmitter of the faith; an enormous demographic change in the ethnic make-up of our parishes; changes in Mass attendance and the drastic decline of vocations to the priesthood and religious life. There are other challenges, too. However, we face these challenges with resources that would have been unimaginable to our parents, grandparents and great grandparents in terms of the educational background, job opportunities and financial status (although many do struggle financially). Our challenge is to steward these resources efficiently so that the mission of Jesus can grow to the fullest. While there has been an increasing shortage of ordained priests and vowed religious there has been a huge increase of lay ministry and for us the wonderful development of lay pastoral leaders. In the archdiocese and in parishes we have many generous and dedicated volunteers who give of their time, talent and treasure to the mission of the Church. Most important of all, the Spirit promised by Jesus and poured out by the Father on the first Pentecost continues to be with us as a sure and steady source of guidance, inspiration and strength. Therefore, we move forward with hope and optimism, not with fear or indifference. Our hope and optimism come from knowing that we are God’s people, that God will never abandon us, and that through the power of God’s Spirit we can confront the challenges before us, even if they do seem to be overwhelming. 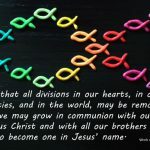 In prayer and in hope we will find creative and constructive solutions that will enable us to continue the mission of Jesus today, and to pass on the treasure of our Catholic tradition to the next generation. Our consultation, ‘A Future Full of Hope’, asks of us a collaborative approach, that is, participation and cooperation by all the members of the Church – priests, religious and laity. It asks us to let go of personal agendas, being open to new possibilities, and when there are difficulties, having the personal faith, hope and courage to continue talking with each other. Our task is to realise that the mission of the Church, namely evangelisation and building up of the kingdom, is a joint responsibility, one that belongs to all of us.